Rediscover the joy of pool ownership with a few simple upgrades. Discover the popular, innovative and new products that will help you finally get the swimming pool of your dreams! Let Aqua-Tech’s skilled team help you fall in love with your pool again! There are many reasons for considering an upgrade. Perhaps you’ve just moved into a new home with an existing swimming pool that would greatly benefit from a refurbishment; your grandchildren want a safer place to play; or maybe you’re looking for a dedicated place to relax and melt your cares away. Whatever the motivation behind your decision to renovate, Aqua-Tech knows that the final product has to bring your vision to life while meeting all of your needs and adding value to your property. When you choose Aqua-Tech to upgrade your swimming pool, you’ll be able to finally experience what it has the potential to be. 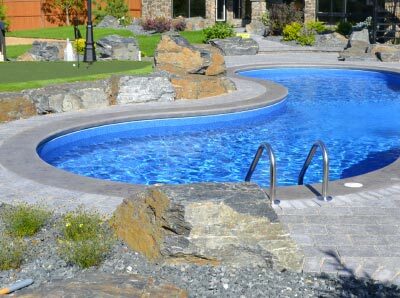 Whether you’d like to overhaul your entire pool with a new shape, add decking or fencing, incorporate custom features, smooth out any unsightly bumps or wrinkles in the liner or make the switch to salt water, Aqua-Tech’s in-house team will be there to complete every aspect of the project, without turning to outside contractors. You’ll be able to take advantage of our dedicated project manager to keep you up to date with the status of your renovation—a benefit you wouldn’t get working with anyone else in Winnipeg. There are few additions that can have as great an impact as an in-wall steps. Refurbishing the way you enter your swimming pool can transform it from a simple pool to an inviting space that’s a natural extension of your home. Over half of the swimming pools we renovate do not originally include a walk-in staircase, making this upgrade one of our most popular enhancements. In particular, the completely seamless vinyl-over-steel stairway is a beautiful addition. Regardless of your choice of materials, by working with our design and installation team homeowners can easily integrate a stunning entry point. Upgrading your swimming pool steps is best done when you’re renovating as it can be seamlessly included into the final design. By taking into account all of your requirements, including safety and ease of entry, Aqua-Tech’s skilled experts will create a custom design, from a dramatic layout to a subtle yet inviting style, beautifully suited to your property. At Aqua-Tech you have an excellent team. Your employees are ethical, professional and reliable. I am very pleased with your company. If your swimming pool has basic incandescent underwater lighting, you’ve probably never experienced just now magical your backyard can be. 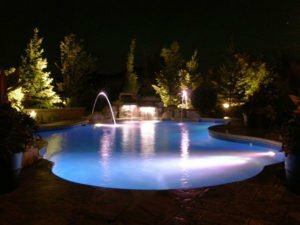 When you’re renovating your pool or backyard, the addition of customized LED or fibre optic lighting can have a revolutionary effect that you can easily manage with simple to operate finger-tip control. Imagine creating an effect with bold colours for a party, individually programming the lights to create a pattern matching the stars or use the beautiful orange and red hues to complement the sunset as you watch it from your pool. When your old pool circulation is replaced with an upgraded system, like the Aqua Genie—an Aqua-Tech exclusive—you’ll be amazed at how such a simple improvement can have such a huge impact on the amount you enjoy your water. Converting from the old school vortex style of circulation to the Aqua-Genie will drastically increase the surface water that moves through the skimmer, keeping much of the debris from sinking to the floor and minimizing the work required to vacuum it up. A properly running system can reduce the time you have to dedicate to maintenance and in the case of the Aqua Genie, you could even reduce your weekly upkeep by 67% while minimizing the amount of cleaning products and saving you valuable time. These are just several options that you could included in a swimming pool renovation. When you speak to our design team, you’ll discover an impressive number of additions and modifications that you can achieve, regardless of the age of your pool or yard space restrictions. 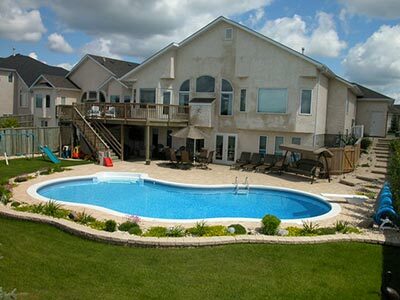 In addition to increasing the enjoyment and use you get of your pool, modernizing and upgrading your swimming pool will also add value to your property. Our team will manage every aspect of your renovation, ensuring that you only have to sit back and wait to dive into your beautiful, new pool. Don’t wait any longer to give your family the swimming pool they deserve. Call now to discuss how we can craft a better place for you to come home to! Get $500 OFF a New Liner! Could your pool benefit from a facelift? To help you ensure your pool is ready for the season, Aqua-Tech is offering $500 OFF all new custom pool liners!